Fine Early California & American Impressionism! 18 x 24 inches, oil on canvas, excellent condition, available! 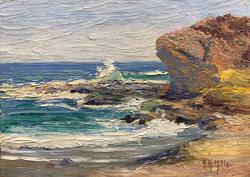 This landmark location with its crashing waves was a favorite painting spot for early Laguna Beach painters. Located just below the new luxury Montage Hotel in South Laguna, it is a short walk north of Aliso Beach. Technique: Anna Hills' most desirable early palette knife style. It is beautifully framed in a handcraved wood gilded frame and is ready to hang on the wall! Actively buying California landscapes by Anna Hills! 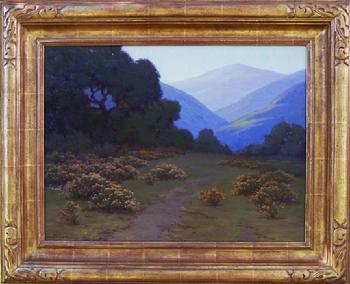 Anna Hills "Desert Sand Dunes"
It was common for members of the Laguna Beach Art Association travel to the PalmSprings area to paint nature's incredible springtime display of wild flowers. 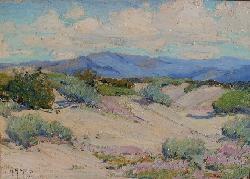 Anna Hills titled this painting "Desert Sand Dunes, near Palm Springs, 1922". It is signed on the front lower left and inscribed verso. It's beautiful handcarved gilded frame showcases this fine painting! 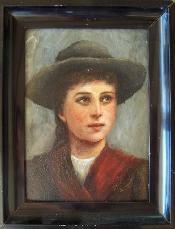 ~ This charming portrait is of the famous young sharpshooter Annie Oakley. ~ It is signed on the front lower right. ~ Thomas L. Hunt was born in Ontario, Canada and eventually settled in southern California, he was actively involved in the Laguna Beach art community and was a founding member of the Laguna Beach Art Association. ~ Please contact our gallery regarding new acquisitions and to be notified of any futureThomas Hunt paintings. ~ We are actively buying Thomas Hunt paintings! Actively Buying Thomas Hunt Paintings!